Audrey Harrer will open up the evening at 8 PM playing experimental pop music on the harp with vocals. At 9 PM Cocek! Brass Band will perform new concert repertoire and rarely played compositions. CBB sounds are inspired by acts like Fanfare Ciocarlia, Fela Kuti, Rebirth Brass Band, Taraf De Haidouks, Slavic Soul Party and chamber music from around the world. Dance music for those seeking something new and unique, contemplative Old World melodies that hark to a lost era and catchy riffs that will have you singing along and tapping your foot all night long. 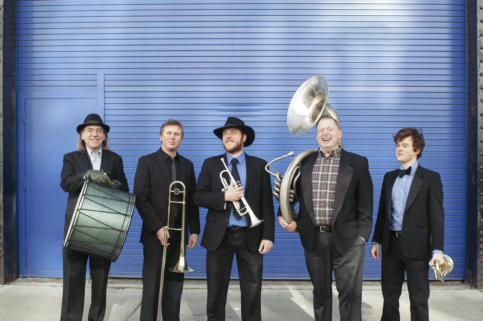 In performance spaces ranging from hollowed out warehouses and arts spaces in Boston to the Kennedy Center in D.C., The Burlington Discover Jazz Festival in Vermont, WorldFest in Louisville, KY and the 11th Annual NY Gypsy Music Festival, Cocek! can be found sprinkling their Phrygian magic dust on audience members all over the world. They also put on programs for schools and universities discussing traditional Balkan/Klezmer & New Orleans Jazz music, its beautiful history and its relation to their original compositions. Audrey Harrer is an experimental pop composer/vocalist/harpist. She collaborates with chamber groups, runs DIY shows, experiments with music technologists, and works in music education. She cares about process, community, and the arts as a means to create connection.